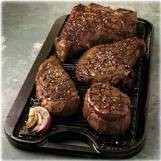 Steaks made tender and juicy, that no one can resist in 45 minutes or less. Consider the joy and satisfaction one can bring to any occasion with perfectly grilled barbecue dry rub steaks. Now you can have that wonderful feeling of joy and satisfaction in no time at all with Jake's Righteous Tri-Tip, Steak and Rib Rub. Making a great rib eye, porterhouse or filet mignon is no more effort than buying the meat, seasoning the steak, and grilling. With Jake's Natural Tri-Tip, steak and rib rub the seasoning just works its way into meat without any physical effort on your part. This steak seasoning contains no artificial sweeteners, harmful salts or MSG and will permeate the layers of the meat fiber without you actually having to rub the meat. Here's a steak recipe we use whenever we make Filets, Rib Eyes or more. 2 or more Prime Rib Eye, Porterhouse, or Filet Mignon steaks. *Caution: This recipe only works with Jake's Righteous Steak, Rib and Tri-Tip rub. Should you use one of those inferior rubs you will definitely be prone to poor results. Always wash your steaks before grilling. Pat dry and prepare the steaks by rolling out 2 long strips of aluminum foil on your counter or cutting board. Place 1 steak at a time on the foil and lightly rub with the Extra Virgin Olive Oil, both sides. Grilling secret: Adding Olive Oil will not only help hold on the dry rub ingredients but will speed up the muscle fiber breakdown allowing all that Righteous Rub to get deep into the nooks and crannies of the meat. Once oiled, shake on 1/2 Oz Jake's Righteous Steak, Rib and Tri-Tip, Rub Seasonings. Wrap the steaks pressing each side to drive the seasonings into the meat without rubbing. Place in a cool, dry location in refrigerator. Prepare the Barbecue grill. We at Jake's use charcoal but not to worry this recipe even works with gas. If using Charcoal evenly spread charcoal around the grill about two layers deep. Start charcoal, let burn until all briquettes are ashed white. For both gas and Charcoal grilling the steaks properly will require a preheat temperature of at least 600 to 800 degrees F and keeping it at this temperature for 30 to 45 minutes before putting steaks on. Oil the grate. An easy way to do this is to take a piece of trimmed fat, hold tightly in a pair of tongs and rub it on the hot grate. Another way is to take a paper towel crumple and hold between your tongs. Pour oil on the paper towel letting it absorb for a minute. Then rub the grates of the grill everywhere you intend to lay the steaks. Once your grill is ready let your steak(s) reach room temperature before grilling. This is another Jake's secret that some might think is unnecessary, but it helps grill your steak more evenly and faster. Trim any excess fat from the steak(s). Any strips of fat should be about 1/4" thick. Also cut through the fat strip about every 1 1/2". When grilling fat shrinks faster than the meat and it can cause your steaks to curl. Grill. Place each steak directly on the hot portion of the grill for one minute. Turn and grill on the second side for an additional minute. Turn and rotate 45 degrees and grill for half the remaining cooking time. Turn again. If you do this right you will get a nice diamond pattern of grill marks. Once steaks have reached your desired temperature, remove them and hold on a covered tray/dish for 5 minutes. This allows the steak to stop cooking and will hold in all those natural juices, besides allowing the steak to reach the right temperature for eating. Serve Righteous Steak and Rib Rub Style Recipe. See our Cooking Tips chart below. This is a pretty good guide to help determine just how long a steak should be cooked to get it to the state you want it. Order your dry rub today and see what all the talk is about. * Listed above are total cooking times; these estimates depend on heat of fire. Be sure to designate half of the time for either side.